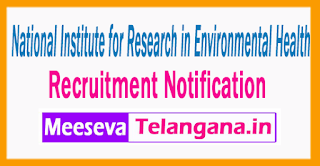 National Institute for Research in Environmental Health (NIREH ) Has Invited Application Form For 15 Technician, Accounts Officer, Scientist . All Eligible Candidates Are Required To check Eligibility details for NIREH Job Advertisement and Apply Offline Before 20-07-2017 All Candidates Who Are Applying For NIREH Recruitment 2017 - 15 Technician, Accounts Officer, Scientist , Check Vacancy Details - Educational Qualifications & Experiences Requirement, Exam Pattern, Syllabus, Age Limit, Selection Criteria, Admit Card, Results, Exam Date, Before Applying. INR Rs. 15600 - 39100/- With 7600/5400/- Grade Pay (Post 1-4), Rs. 9300 - 34800/- With 4600/- Grade Pay (Post 5), Rs. 15200 - 20200/- With 1900/- Grade Pay (Post 6). Candidates upper age limit should not Exceed 45 years (Post 1), 40 years (Post 2,4)& 35 years (Post 3), 32 years (Post 5), 28 years (Post 6). Age relaxations will be applicable as per the rules. All Interested Job Seekers should have completed 12th, B.E.&B.Tech, Bachelor’s Degree, Post Graduate Degree, MBBS Degree or its equivalent qualification from A recognized Board/University. All Eligible job seekers Can Download application Form through official website (http://www.nireh.org). After Filling The application form, candidate must send by hard copies of application along with relevant testimonials to the following Address before- 20-07-2017. 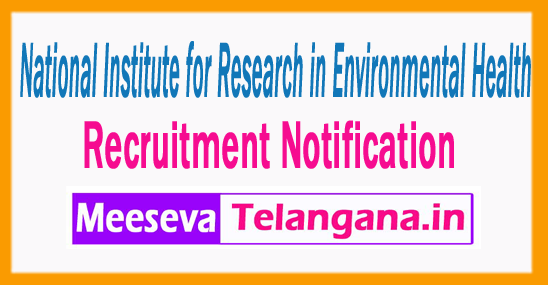 Director, ICMR-National Institute for Research in Environmental Health (NIREH), Kamla Nehru Hospital Building, Gandhi Medical College Campus, Bhopal - 462001.